Association Conventions & Facilities magazine’s DISTINCTIVE ACHIEVEMENT AWARD recognizes those hotels, resorts, conference centers, convention centers and convention and visitors bureaus that have demonstrated their overall commitment to excellence. The 20,500+ subscribers of Association Conventions & Facilities are offered the opportunity to vote for hotels, resorts, conference centers, convention centers and CVBs that effectively hosted their meetings and events based on the criteria as noted below. Ballots are sent to subscribers via email. Eligible ballots are limited to those submitted by meeting planner subscribers; and only one ballot per subscriber is accepted. Ballots from industry suppliers such as hotel properties are not accepted. Winners are announced in a special awards section of the August/September issue of Association Conventions & Facilities and have the opportunity to purchase either a full- or half-page advertisement that is accompanied by FREE matching space. Full-page ads receive 4/color editorial coverage including a photograph and contact information. Half-page advertisers receive a half-page of matching space. 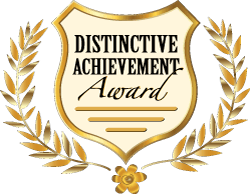 In addition, advertisers will receive a handsome, engraved Distinctive Achievement Award plaque.